[adsense_left]A maioria das pessoas conhecem várias celebridades pelo seus nome artísticos. Você já parou para pensar qual o nome daquele cantou ou cantora de quem você é fã? Ou daquele ator ou atriz que brilham nas telas de cinema? 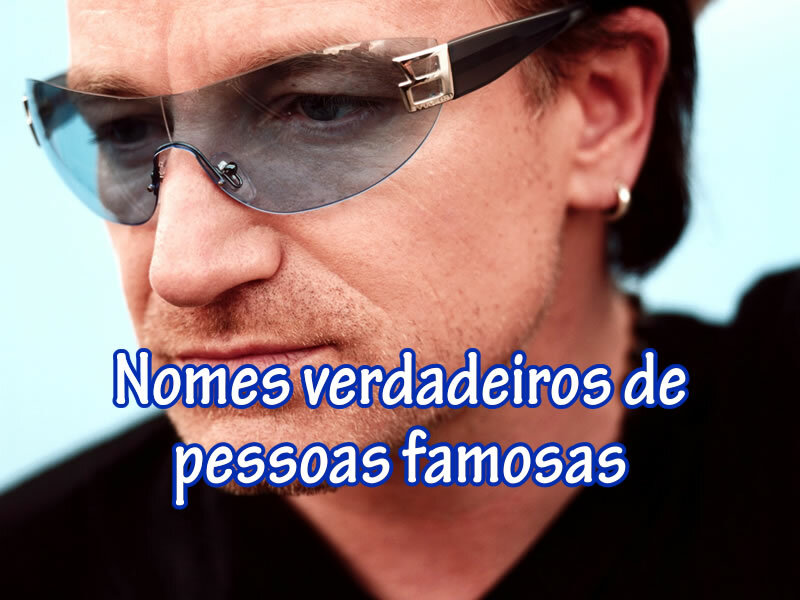 Você conhece o Paul David Hewson, o Curtis Jackson e a Stefani Joanne Angelina Germanotta? Pois bem, essa lista revela os nomes reais de vários artistas, como cantores, cantoras, atores, atrizes, escritores e muito mais! Al Sharpton – Alfred Charles Sharpton Jr.
Big Pun – Christopher Carlos Rios Jr.
Big Rich – Richard Bougere Jr.
Billy Vera – Billy McCord Jr.
Bobby Vinton – Stanley Robert Vintula, Jr.
Brian Keith – Robert Kieth, Jr.
Buckwheat Zydeco – Stanley Dural, Jr. Buddy Ebsen – Christian Rudolph Ebsen, Jr.
Chingy – Howard Bailey Jr.
Common – Lonnie Rashid Lynn Jr. Consequence – Dexter Raymond Mills Jr.
Coolio – Artis Leon Ivey Jr.
Cory Gunz – Peter Cory Pankey Jr.
DJ Screw – Robert Earl Davis Jr.
Douglas Fairbanks, Jr. – Douglas Elton Ulman, Jr.
Droop-E – Earl Stevens Jr.
Dwayne Wade – Dwayne Tyrone Wade Jr.
Easy Mo Bee – Osten Harvey Jr. Flavor Flav – William Jonathan Drayton, Jr.
Frank Zappa – Francis Vincent Zappa, Jr.
Funkmaster Flex – Aston George Taylor Jr.
Gerald R. Ford – Leslie Lynch King, Jr.
Irv Gotti – Irvin Domingo Lorenzo Jr.
Jackie Cooper – John Cooper, Jr.
Joe Tex – Joseph Arrington Jr.
Joey Lawrence – Joseph Lawrence Mignogna, Jr.
John Denver – Henry John Deutschendorf Jr.
Johnny Ace – John Alexander Jr.
Jon Bon Jovi – John Francis Bongiovi Jr.
Judge Reinhold – Edward Ernest Reinhold Jr. Junior Walker – Autry DeWalt Walker Jr.
Kareem Abdul-Jabbar – Ferdinand Lewis Alcindor, Jr.
Keith Murray – Keith Omar Murray Jr.
Khulo [Goodie Mob] – Willie Knighton Jr. Kid Frost – Arturo Molina Jr. Kid Ink – Brian Collins Jr.
Kreskin – George Kresge, Jr.
Levar Burton – Levardis Robert Martyn Burton Jr.
Lil Easy E – Eric Wright Jr.
Lil Wayne – Dwayne Michael Carter Jr.
Link Wray – Fred Lincoln Wray Jr.
Lionel Richie – Lionel Brockman Richie, Jr.
Lloyd – Lloyd Harlin Polite Jr.
Luther Vandross – Luther Ronzoni Vandross Jr.
Mac – Barron Victor Jr.
Madlib – Otis Jackson Jr.
MC Holiday – Sam Jacobs Jr.
Mickey Rooney – Joe Yule Jr.
Mickey Rourke – Philip Andre Rourke Jr.
Mike Douglas – Michael Delaney Dowd, Jr.
Mitch Ryder – William Levise Jr.
Muhammad Ali – Cassius Marcellus Clay Jr.
Nelly – Cornell Haynes Jr.
Public Enemy [Flavor Flav] – William Jonathan Drayton Jr.
Quincy Jones – Quincy Delight Jones Jr.
Ray-J – William Raymond Norwood Jr.
Rick James – James Ambrose Johnson Jr.
Rico Love – Richard Butler Jr.
Rip Torn – Elmore Rual Torn Jr.
Robert Horton – Meade Howard Horton, Jr.
Robert Redford – Charles Robert Redford, Jr.
Rock Hudson – Leroy Harold Scherer, Jr.
Schooly D – Jesse B. Weaver Jr.
Snoop Doggy Dogg – Cordozar Calvin Broadus Jr.
Spice 1 – Robert L. Green Jr.
Sugar Ray Robinson – Walker Smith, Jr.
T.I. – Clifford Joseph Harris Jr.
Taurean Blacque – Herbert Middleton, Jr. Troy Donahue – Merle Johnson, Jr.
Turk – Tab Virgil Jr.
WC – William Calhoun Jr.
Webbie – Webster Gradney Jr.
Will Smith – Willard Christopher Smith Jr.
Will.i.am (The Black Eyed Peas) – William James Adams Jr.
Young Bleed – Glenn Clifton Jr.
Yukmouth (Luniz) – Jarold Ellis, Jr.
← Inexistent Man Store – Conheça a nossa loja virtual!